When it comes to signage in public buildings, the Americans with Disabilities Act (the ‘ADA’) generates a great deal of concern, confusion, and in some cases, compliance risk – to building owners and property managers. In fact, on March 28, 2014, the maximum penalty for a single ADA violation increased to $75,000 for the first offense. Signage in public buildings is not exempt from ADA requirements and potential fines. Consequently, it is important that building owners and property managers understand the basic requirements that will ensure ADA compliant interior signs. The ADA legislation impacts many aspects of required signage in public buildings. The first priority of building owners is of course to ensure that facilities are accessible to all tenants and visitors, including individuals with disabilities. In addition, building owners want to ensure that their signage is fully compliant with the law, and does not place them at risk for fines and penalties. In general, ADA regulations apply to signs that are considered ‘architectural,’ in that they are permanently attached to the building and direct or inform about functional spaces, such as restrooms, exits and entrances, stairwells, and places of refuge. For the most part, advertising and promotional signs, company logos or signs not permanently installed on the building are exempt from complying with the ADA. ADA signs have both tactile elements, for vision impaired individuals, and braille elements, for blind individuals. 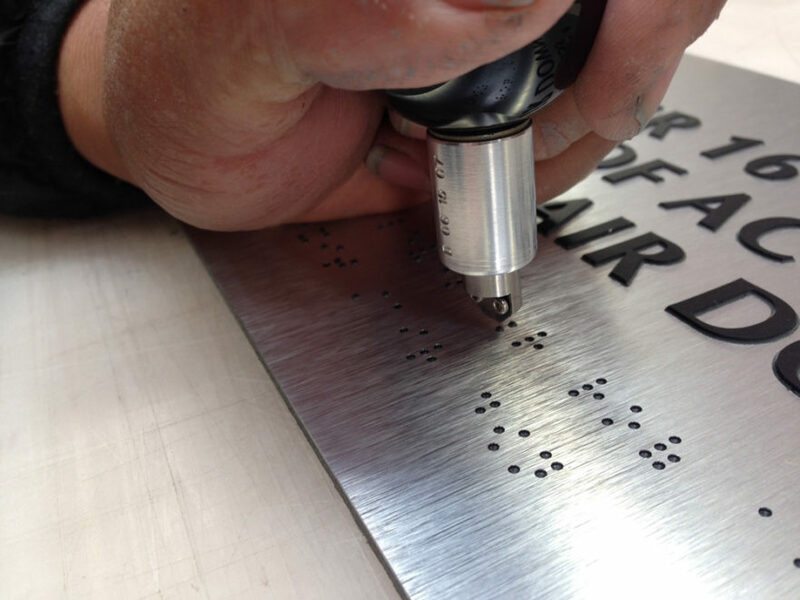 There are very detailed requirements regarding the design and construction of the braille and tactile elements, and these are often the source of non-compliance issues. Given the fairly detailed requirements for ADA compliant signage and the potentially significant penalties for non-compliant signs, are building owners doomed to simply purchasing stock blue-and-white plastic signs? Of course not. Good design is important, and can be found in ADA compliant signage. However, it is important to work with custom sign design and fabrication partners who know the ADA requirements, and hence can design and build compliant signage. Starfish Signs and Graphics has extensive experience designing, manufacturing and installing ADA compliant signs in businesses all over Orange County and Southern California. We have the knowledge and experience to ensure that your ADA signs are compliant while still incorporating the design elements that are important in your building or project. Call or message us today regarding your ADA signage requirements, and a project manager will contact you.